My slow re-watching of ARIA continues and I've finally finished ARIA the Natural. The Natural was a lot of pure slice-of-life with many episodes focussing on the "experience" of the characters rather than carrying particular "messages". There are times when courage is necessary but if you open your arms, you may have new encounters in the most unexpected places. Many attempts at achieving an objective may fail but one must always remember that you will succeed in the end. The discovering of certain things/experiences is not possible without failure. What one discovers after failure may be of greater value than the original objective. Just like how mirrors reflect your own image, other people whom you interact with reflect your own heart. You can meet past people and feel their emotions by seeing what they leave behind. You can only be yourself. It is impossible to completely emulate and “become” another person. Any encounter you have is possibly a miracle (well, with the laws of probability, it is!). Important feelings are something which you grow and nurture over time. People have a tendency to magnify the bad things in life, and end up making it far worse than it actually is. 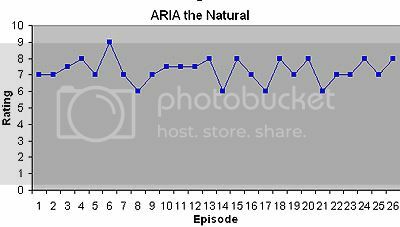 Just for fun, I also tried rating individual episodes of the Natural to come out with an average. Came out with an average of 7.27 and comes out slightly lower than The Animation (7.46). The Natural didn't really have a huge "WOW" episode but was consistently good throughout. If I remember well, ep6 was one of the most important episodes during my "healing". Maybe because, I has a same personality as Alice. I'm planning to rewatch every season again :D But yeah, as you pointed out, Natural had less moments of epiphany and surprise, though it was loaded with emotion once in a while. Thinking about the Opening Song switch during the Gondola episode (must've been around episode 14 or 16, gah forgot), I still get the goosebumps. I guess that's the most memorable episode I remember from Natural. Agreed. I go to talks organised by a meditation group sometimes and what they teach me is actually something I already know but have all too-easily forgotten, much like the stuff in ARIA.